Ted Burke LIKE IT OR NOT: Dave Lucas and "Steelhead"
hunter/gatherer behaviors one would have thought had been refined out of him. defiance.It would have been fine if Lucas had pondered the sadness, if sadness is the word, in terms less lofty, but he ruins, utterly ruins his effect by the ham-handed and equivocating insertion of "...and stares back with what must be called defiance." Well, no. We shall call it a dead fish and admit that fish eyes are expressionless, in fact, they exhibit no nuance of emotion, and that the term "fish eye" is synonymous with a stare that is seemingly without life, emotion, or empathy. hooking this particular fish. It's obvious, and it seems false in execution. One would imagine people this given to revealed truths from common events would be too sensitive to fish in the first place. This might have worked better had Lucas given us a proper parallel set of events. Imagine this poem's narrative commencing without the attempted anthropomorphizing, just told straight faced, and then we have the fisherman involved in his own struggle that he would struggle with, seemingly in vain, such as trying to get out of snowed in parking lot, or being at the end of a very long line for gas. Just a suggestion, but the point is that the comparison between the fish he hooked and human qualities would be more plausible, less strained. 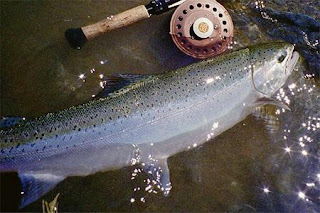 The steelhead is imbued with human characteristics such as "spirit", "courage" and "defiance", which indicates that the narrator his comparing his lot against that of the creature hooked on the line. primal activities where raw survival is the only matter at hand. In any regard, I think the implicit message is more of a package one deals with when they decide to write this kind of poem, which is to say that it's less Lucas doing the talking/musing than it is a fulfillment of genre expectation. the regret of winning the battle hits him. What it comes down to was that what he might have seen--Lucas is smart to hedge on his qualifications-- , whether courage, spirit, defiance, are intended as a Lesson. Lucas wants the lesson to be a military one; given the choice of qualities he tentatively assigned the Steelhead. All this is certainly implied, and it's worth bringing out. invasion and defense of territories and to think of it as a critique, somewhat, of the current failure of American foreign policy, but that it became a labor-intensive riff as I worked on it. Sure, the elements are there in order to make the case, but I still think Lucas is wandering through Rousseau's neck of the woods and imagines himself in battle with an ennobled animal. Lucas is a good writer, but I'm not enamored of the mythology he wants to handle with a straight face here, unless, of course, he were willing to step several miles further than the conventional struggle/victory/winner's remorse scenario these pastoral situations must have and instead do something truly remarkable. There's a Paul Auster novel I can't remember the title to in which the point of view is the dog's who, credibly, is burdened with the task of finding a new master when it realizes his current one is dying. A remarkable read for a straight-forward novel.